Hydro One’s heroic effort to restore power to the city in the aftermath of the tornado earned them a standing ovation at Algonquin’s second annual Alumni of Distinction awards gala Sept. 27. Hydro One also received the nights Alumni Employer of the year award. “Thank you for the quality of education and graduates you provide – our company and community are better off as a result,” said Lyne Parent-Garvey, Chief Human Resources Officer for Hydro Ottawa, during his acceptance speech on behalf of the company. Cheryl Jensen, president of Algonquin, gave the keynote speech at the event to thank the alumni. She also spoke about the inspiration she found in the many stories shared by the night’s honorees. The first award of the night, The Apprenticeship award, went to John Liptak, President and CEO of OakWood and a 1978 General Carpenter graduate. 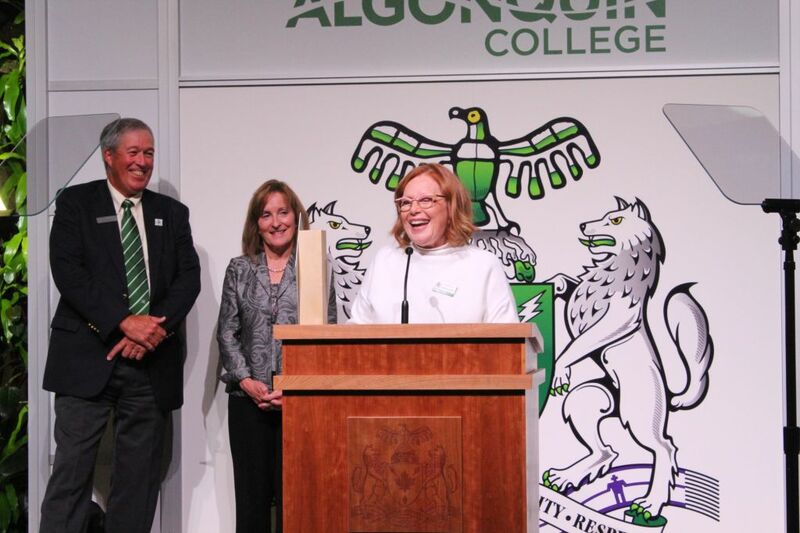 Liptak thanked Algonquin for providing a foundation for all he has learned about business and trades, noting he “always looks for Algonquin college graduates” when making hiring decisions. The Changing Lives award went to Elaine Kicknosway, Co-Founder of the National Indigenous Survivors of Child Welfare Network and a 1989 Early Childhood Education graduate. Kicknosway was unable to receive the award herself that night, as she was accompanying her son Theland to the United Nations in Geneva who is speaking as a Children Human Rights Defender. Accepting the award in her stead, colleague Colleen Cardinal praised Kicknosway’s commitment and work ethic. Community Services award winner Kevin Newell, a 1985 graduate of Ambulance and Emergency Care (Paramedic), who accepted his award “on behalf of all paramedics,” was honoured for a distinguished career that included serving as Deputy Paramedic Chief, Ottawa Paramedic Service. The Creative Arts and Design award went to Marie-Cecile (Cezin) Nottaway-Wawatie, Chef and Owner of Wawatay Catering and a Chef Training and Culinary Management graduate in 2004. In a speech highlighting the adversity she overcame to build her business “from the ground up” while raising two young children, she thanked everyone who had helped her succeed. The Rena Bowen Volunteer Award of Excellence went to Michael O’Byrne, News at Noon Anchor, CTV News, and a Journalism graduate. However, even though O’Byrne may have attended Algonquin a few years ago, his graduation is much more recent. 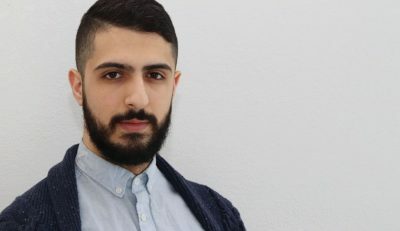 When O’Byrne left his studies at Algonquin to take his first job, he was a few credits short of graduation- lacking a credit in Accounting and History – and only years later took the equivalent courses he missed to earn his diploma. The Health Sciences honouree Kyla Cullain, co-founder and director of BuildAble, earned her Bachelor of Science in Nursing in 2008. The Technology award went to Stuart Russell, Co-Founder and CTO, You.i TV and a 1995 graduate of Electronics Engineering Technology. Alumna of the Year Donna Dooher, Chef and Owner of Mildred’s Temple Kitchen – and a 1983 graduate in Culinary Arts accepted the final award of the nights gala. The event to honour and recognize former Algonquin students was held in the college’s Minto/ACCE building, transformed into a gala dining hall by Ottawa Special Events where Tourism and Travel Services graduate Micheal Wood is a partner. 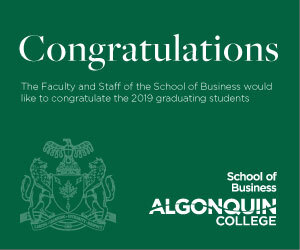 Fittingly, the connections to former Algonquin College graduates did not end there. Nearly every aspect of the of the night’s event was produced, provided and presented by Algonquin college Alumni. From the floral centrepieces provided by agricultural industries graduate Eric Cardinal – owner of Mood Moss in Ottawa – to the menus designed by 2018 Alumni of Distinction award recipients Donna Dooher and Marie Cecile Nottaway, the night was only made possible by the talents and accomplishments of Algonquin College graduates. The night’s entertainment, of course, was also provided by Algonquin’s roster of talented graduates. Mubarak Farah, a graduate of the music industry arts and founder of Ability Through Music provided musical accompaniment for the night. Emcee duties and G-rated dad jokes were Board of Directors member Jeff Turner and the college’s Executive Director of Truth, Reconciliation and Indigenization Ron Mclester. While the gala may have focused primarily on the present accomplishments of past graduates, Cheryl Jensen ended the night with a look to the future. Algonquin alumni who help keep Ottawa’s lights on honoured at gala Reviewed by Stuart Benson on October 1, 2018 .